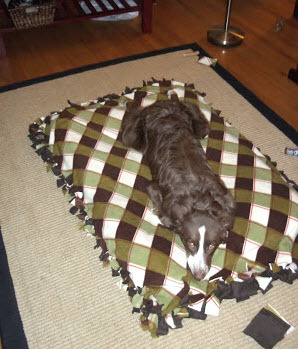 Make a bed for your dog without any sewing! Get a pillow or folded comforter to use as a mattress for the bed. Measure the mattress, then add several inches onto the measurement for each side. Cut out the size needed from fabric twice, then cut slits along the edges of both fabrics to create fringe. Put the mattress between the two pieces of fabric, then tie the fringe pieces together.